Random thoughts about life in north Texas by a veteran public relations practitioner, consultant and former university lecturer in Denton, which is always a few degrees cooler than Dallas. 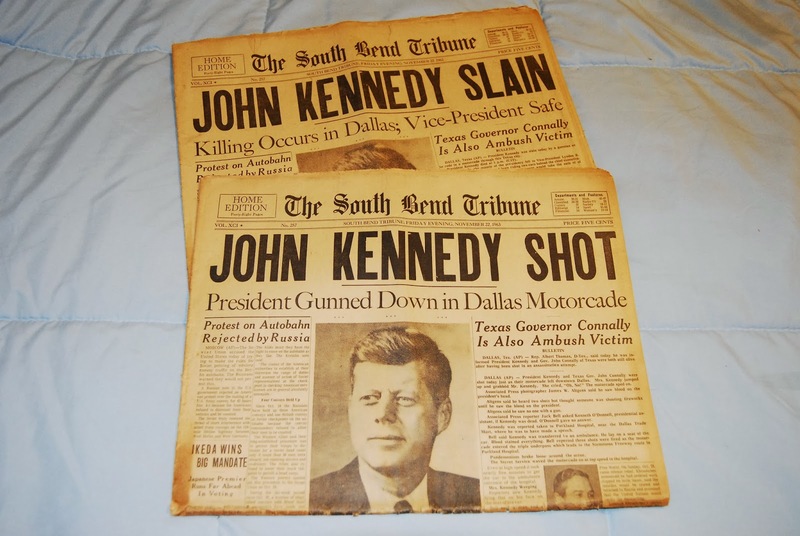 Social media 1963 style–two editions of the afternoon paper. Living in the Dallas/Fort Worth Metroplex, it’s impossible to forget what happened 50 years ago today. Like so many alive on that fateful day, I vividly remember much of the day and those following. I was in third grade at Lydick Elementary School in South Bend Indiana. I remember the teacher being called out of the classroom. When she returned, she was crying. A few minutes later the principal announced that the president had been shot, and we were being sent home for the rest of the day. It was much easier in those times to send kids home from school because there were fewer working moms, fewer single moms. Moms were at home crying in front of their TVs because of the news that was announced when their favorite afternoon soaps (in Mom’s case As the World Turns) were interrupted. On the bus, the driver had a small transistor radio with him. He’s the one who told us “He’s dead. Somebody killed the president.” The bus got quiet. A few girls cried. Somebody asked if the Russians (as we all called the Soviets then) did it. 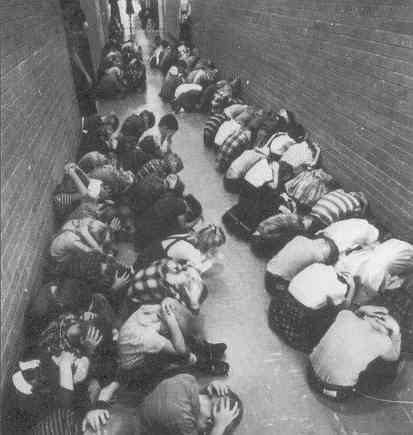 You see, this was in the days of “duck and cover” drills, the Cold War exercise designed to make us feel like there was something we could do to save ourselves in the event of a nuclear attack. All it really did was scare the crap out of a whole generation. At home we watched CBS News with Walter Cronkite. It was the first time for live “wall to wall” coverage of news events. (WFAA-TV has made their 1963 live broadcast available on their website.) My brother Mike, in high school then, came home and Daddy soon followed. There were phone calls. I guess that’s how my parents knew to go to church–or else it was announced on TV that our Catholic church would be having special prayers. We sat in the warm, dark church, which was packed, and the priest led us in a rosary, and there was adoration of the Blessed Sacrament. We prayed for peace, for the safety of our nation. I remember feeling very bewildered by it all. Mom and Dad and Mike and the adults all talked about scary things and political stuff I didn’t yet understand. 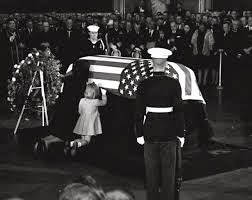 The rest of the weekend seems to be a blur of constant TV watching, including seeing Oswald shot, Kennedy’s lying in state in the Capitol–and Jackie and Caroline kneeling before it–culminating in the moving funeral on Monday. Among my memories of the funeral are the horses, the clattering of hooves, the drums, and the silence of the huge crowds lining the streets of the nation’s capital all the way to Arlington National Cemetery. America changed then, in many ways. The innocence and optimism of the ’50s gave way to cynicism. As conspiracy theories swirled and the Vietnam war escalated, Americans grew less willing to accept everything the government told us. We asked questions, we protested, we got involved. During the fall semester I teach a class at the UCD in downtown Dallas, across the street from the building where Oswald was shot by Jack Ruby. My route home takes me through Dealey Plaza. 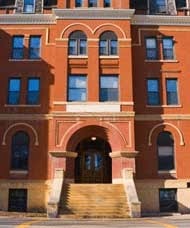 I have never driven through there when there was not someone–alone or in a group–walking around, looking at the Texas School Book Depository, or the grassy knoll. Living here means I have the privilege of attending events at which people who were witnesses to this historic tragedy speak. Five years ago, at a Dallas Press Club event, I heard Buell Frazier tell his story as a panelist in a program that included several key figures from the events of that day. He’s the guy who drove Oswald to work, and he’d never told his story publicly before. Among the people I’ve had the honor of meeting is Hugh Aynesworth, former Dallas Morning News reporter, author, and the only person to witness the assassination, Oswald’s arrest, and later his murder. He produced a fascinating documentary that was screened at UNT this past week. The screening, and the Q & A afterward brought back memories for those of us who remember the end of Camelot. For most of the students in the room, November 22, 1963 is a date in a history book. For those of us who remember, it was a defining moment in our lives. © Samra Jones Bufkins and The View from Little D, 2009--2016, on the posting date. Excerpts and links may be used, provided that full and clear credit is given to Samra Jones Bufkins and The View from Little D with appropriate and specific direction to the original content. Unauthorized use and/or duplication of this material without express and written permission from this site’s author and/or owner is strictly prohibited.